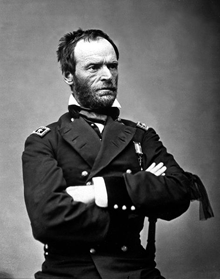 William Tecumseh Sherman as a major general in May 1865. The black ribbon of mourning on his left arm is for President Lincoln. General Sherman is famous for having said, upon learning that there were those who wanted to nonimate him for the office of President in the election of 1864, "I will not accept if nominated and will not serve if elected." Such unambiguous statements are so rare in U.S. politics that they are now called Shermanesque statements. Apparently, it was necessary to be so unambiguous, even in 1864, because the population in general, and the press in particular, had grown so accustomed to carefully parsing the statements of public figures. For Gen. Sherman to decline any less explicitly probably would not have been effective. We rarely need Shermanesque statements at work, but humor can be a useful tool in achieving the required level of clarity. Portrait by Mathew Brady, available at Wikipedia. Some people write email badly. It's unclear, ambiguous, or just hard to understand. When they speak on the phone, or in person, what they say seems less opaque, because if something isn't clear, you can ask a question, and you get a clarifying answer. No, these people seem to be unclear only in email. Among those who fairly consistently write unintelligible email messages are those who don't know the language well. They aren't the subjects of this article. Let's consider only those who know the language and who consistently author unintelligible email messages. What's going on? To understand why these people produce unintelligible email messages, begin by appreciating the advantages ambiguity and opacity offer to senders of such messages. By avoiding commitment to clear positions, the authors of unclear email messages leave themselves room to maneuver. If one possible interpretation proves wrong or politically undesirable, the author can say, "No, I didn't mean that, I meant this." Consider, for example, ambiguous or unclear messages that supposedly contain directions or orders. If the directions are unclear, the author can claim that the recipient misinterpreted them if trouble develops. If the order is unclear, and trouble develops, the giver of the order can claim that the action taken was not the action that was ordered. Ambiguity shelters the author from responsibility. room to maneuver clarity is difficult. Authors must consider possible misinterpretations of what they write, and devise language that limits the interpretations to those the author intends. Ambiguity is much easier to achieve. The effect on recipients can be maddening. They often know that seeking clarification is risky, but choosing an interpretation that might be wrong is even riskier. They huddle among themselves, working out scenarios and hoping they'll discover the right interpretation, or maybe one that's less risky than the others. They dare not seek telephonic clarification, because they need evidence justifying the choice they ultimately make. A phoned request for clarification doesn't help. There is a tactic that sometimes works. Recipients can send the author of the ambiguous message an email message that reads, in essence, "OK, got it. We'll do X, exactly as you suggest in your message below." The author of the ambiguous message then has a choice: (a) approve the interpretation; (b) correct it, again ambiguously; or (c) deny receiving the message. If the sender chooses (a), and X is unambiguous, the recipient has the clarification sought. If the sender chooses (b), the recipient can repeat the tactic. After a pattern of responses of type (c) is established, they lose credibility. Would you like to see your comments posted here? rbrenYrnXjfjZvvtcnybfner@ChacCBdVgAwVvFjFsvoFoCanyon.comSend me your comments by email, or by Web form. Extended interviews provide multiple opportunities for detecting lies by people intent on deception. Here's Part IV of our little collection of lie detection techniques. See also Effective Communication at Work, Workplace Politics and Writing and Managing Email for more related articles. I offer email and telephone coaching at both corporate and individual rates. Contact Rick for details at rbrenLnwiuDqSLDvxgLxEner@ChacmRflKBkkqTKMHJkNoCanyon.com or (650) 787-6475, or toll-free in the continental US at (866) 378-5470.